Many people prefer to travel to Spain in autumn, want to know why? Well, for starters, it’s the perfect time of the year to go sightseeing as there are twice as less tourists, making for a comfortable atmosphere for exploring all main attractions without the heavy crowds. What is more, the weather in Spain from September to November is warm, sunny and mild - a pleasant gift left after the scorching heat of the past summer months and another decision-making point for those planning a trip to Spain. Keeping that in mind, we’ve put together new private tours to Spain, custom-made for those wise travelers who want to see it all! This 11-day getaway to Spain is all about the experience. The tour starts with 3 days in Spain’s capital and includes matchless sightseeing with private guides who take you around the old town of Madrid de los Austrias, covering the Royal Palace, Puerta del Sol, Retiro Park and the unparalleled Prado Museum. Accompanied by private drivers from start to finish, you continue northwest to see ancient musts in Segovia. You see Segovia's remains of the Roman Empire, the most spectacular castle in Spain, as well as tour the UNESCO-listed city of Avila. Then on to Salamanca, home to the oldest University in the country and the 15th century House of Shells. Among other highlights are Leon’s Cathedral and Royal Pantheon of the Church of San Isidoro and several days in Santiago de Compostela, the capital of Galicia renown worldwide for being the culmination of the Camino de Santiago pilgrimage route. Are you a fan of Barcelona or someone who's intrigued by Spain’s extraordinary Basque Country? Then this all-embracing program is the choice for you! In 11 days traverse Spain on a route reminiscent of a lucky “horseshoe” and immerse yourself in the beauty of 4 regions: Catalonia, Basque Country, Rioja and Madrid. 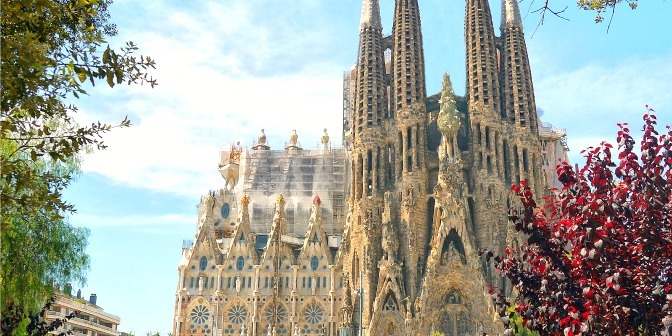 Begin in legendary Barcelona and explore the best of the best of its Gothic Quarter and incredible creations of Antoni Gaudi. After zoom away north on a high-speed train to San Sebastian, set on the shores of the Bay of Biscay, to see its Kursaal Palace area and historic treasures. Plus spend a full day in the Rioja region visiting famous wineries and tasting local wine. Continue to Bilbao and its eccentric Guggenheim Museum and cozy Casco Viejo old town. As a grand finale see Madrid from its brilliant city center to its historic part, Madrid of the Bourbons. If you’ve already been to Madrid, consider a similar tour to Spain: Barcelona and Northern Spain with a twist to see Leon, Santiago de Compostela and port-city La Coruna right after Bilbao. Feeling like Southern Spain is dearer to your taste? Set off on a private tour from Madrid to the sun-kissed Andalucia region, especially lovely in autumn. Apart from the major sights of the Spanish capital, plunge into its historic capital, Toledo during a full day guided tour of its must-see landmarks. Then travel south to Seville to experience authentic Spanish spirit and culture, visit the oldest royal residence in Europe - Real Alcazar of Seville. Then go to Cordoba, once the largest city in Roman Spain, home to 14th-century Alcazar de los Reyes Cristianos and the oldest mosque in Europe. This adventure would certainly not be complete without a couple of days in Granada, its medieval architecture, Alhambra Fortress, and of course, the included special cultural treat - a Flamenco performance in the caves of Granada. These programs are examples of what your one-of-a-kind journey to Spain could be, and the best part is that the tours are fully customizable according to your preferences. So if you’d like to add on a few days or include something extra, we can mix and match a Spain tour you’ll remember for years to come! Plan your insightful tour to Spain with Firebird Tours.